Uwe Rosler could not get his tactics right this time. 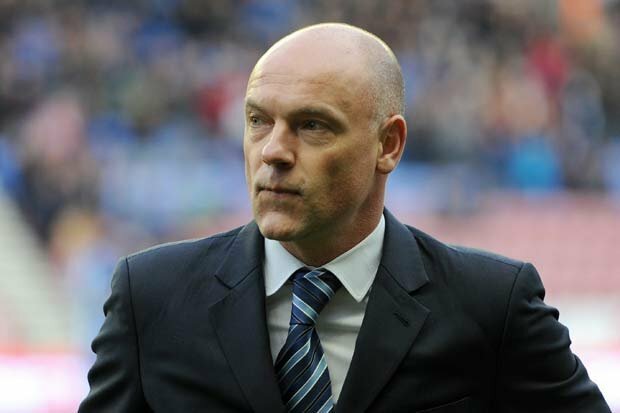 “We’ve all got to take lessons from the performance, myself included” said Uwe Rosler post-match. So often since his arrival Rosler has got his tactics just right. This time he got them totally wrong. Playing hoofball was never going to be the way to get a result at Burnley. It played into the home team’s hands. Rosler made his usual rotations with Stephen Crainey, Jack Collison, James McClean and Marc-Antoine Fortune coming into the starting lineup, The German adopted a 4-3-3 formation, with McClean playing wide on the right and Beausejour on the left. The Urban Dictionary describes hoofball as involving the ‘hoof”, a long punt up the pitch by either the goalkeeper or defenders, making sure that the ball travels at least 40 yards in the air. Wigan Athletic’s tactics in the first half at Turf Moor were precisely that. The result was the ball pinging back and putting pressure on a shaky Latics defence. The left hand side of defence had looked particularly vulnerable and it came as no surprise when Burnley went ahead after 22 minutes. They broke through at pace on Wigan’s left, Dean Marney evading Leon Barnett and putting over a fine cross converted by Ashley Barnes as he timed his run perfectly, ahead of Emmerson Boyce. Soon after Burnley almost got another one through the same players linking up, but Barnes’ effort was saved by Al-Habsi. Burnley were playing that brand of direct football that Bolton used to employ under Sam Allardyce. Their two strikers Danny Ings and Ashley Barnes were causing Latics’ central defenders problems as Burnley constantly sought them out. Wigan’s sole central striker, Fortune, was having a torrid time out there given the horrendous service he was receiving. However, from Wigan’s first meaningful attack he had a fine header hit the crossbar from a Jordi Gomez free kick, Boyce putting the rebound wide. Soon after an elbow from Barnes gave Boyce a gash on his forehead. The Burnley player received a yellow card, but Boyce was clearly incensed. The home team continued to dominate and went 2-0 up in the 42nd minute with a superb inswinging free kick from Michael Kightley from the left, which evaded Al-Habsi and the Latics defence. It appeared that the ball had glanced Crainey’s head on the way into the far corner of the net. With Latics looking set for a hiding, Rosler had to do something at half time. He brought on Callum McManaman for Gomez and Rob Kiernan for the hapless Crainey, reverting to 3-4-3. McManaman looked lively from the start, but Burnley had clearly done their homework and singled him out for physical treatment. Kightly once again looked dangerous and had a powerful shot go narrowly wide of the post in the 49th minute after he had run through from the half way line. McClean had switched to the left flank, after a torrid first half on the right, and was beginning to find some space. However, his final ball once again left much to be desired. Sheer persistence on the part of Fortune enabled him to get between the defence and the goalkeeper, but his effort was saved. Ings had a fine effort hit the post. Soon after Boyce had a header go wide. In the 67th minute Al-Habsi made a fine save from a David Jones free kick. Burnley continued to look dangerous and in the 80th minute Barnes hit a rasping volley that was parried away by Al-Habsi. The final whistle led to Burnley celebrating their promotion back to the Premier League – a remarkable achievement on a relatively low budget. Following the tactical switch at half time Latics had a more balanced look, but in all truth Burnley could still have added more to the score. Wigan’s football in the first half was reminiscent of the darkest of days under Owen Coyle. Burnley’s high pressing put pressure on Wigan defenders and they responded by hoofing the ball. The midfield was largely by-passed but when they did get the ball they were unable to do much with it. Even Jordi Gomez ended up putting through long punts, which were hopeful at best. At times in that first half it appeared that Latics players were actually following instructions by playing those long, hopeful passes. Wigan have done this under Rosler before, but this time they were made to pay the price. Wigan were unrecognizable from the side that had played such stylish football against Arsenal and Reading. One longed for the cultured touch of Shaun Maloney, but Rosler resisted the opportunity to bring him on. Roger Espinoza and Martyn Waghorn did not even make the bench. However, Waghorn appeared to have an injury after going off against Reading. Like Maloney, Espinoza has had a lay-off due to injury and in the long-run Rosler’s decision not to use either might well prove to be right. So often over the past weeks Latics have had dips in their form that could be attributed to sheer tiredness, given the number of games they have had to play. Fatigue may have played a part in this performance too, but it was the approach that was more of a concern in this game. Ali Al-Habsi: 5.5 – made some good saves, but looked nervy. Poor distribution. James Perch: 5 – way below his best. Emmerson Boyce: 5 – rattled by the injury he received from Barnes’ elbow. Below his best. Leon Barnett: 5 – lacked composure. Poor distribution. Stephen Crainey: 4.5 – ineffective. Taken off at half time. James McArthur: 5 – could not impose himself in midfield. Looked jaded. Jack Collison: 4.5 – very disappointing. Jordi Gomez: 5 – marked out of the game. Taken off at half time. James McClean: 4.5 – anonymous in the first half. Distribution poor. Substituted after 77 minutes. Marc-Antoine Fortune: 5.5 – toiled unsupported against the robust Burnley central defenders. Unlucky with his header that hit the bar. Jean Beausejour : 5 – below his best. Callum McManaman: – heavily marked, but tried to breathe life into the attack after being brought on after half time. Rob Kiernan: -looked Latics most composed defender after coming on at half time. Nicky Maynard: – came on for McClean after 77 minutes.